French Country Bathrooms: Easy-to-copy ideas for an authentic look. "French country bathrooms & vanities: design your own, with these original pictures and creative ideas." Country French bathrooms (and vanities) are a thing of the 20th century. 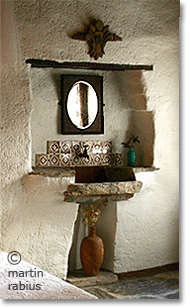 Before 1900, people in the French countryside would have had a pitcher and a washbowl on a stand in their bedroom. And if they wanted to wash themselves down a bit more thoroughly, they'd bring a basin into the kitchen (usually the warmest place in the house). However, pitchers & bowls weren't just the "poor people's French bathroom". The American painter Mary Cassatt, who lived much of her adult life in France, painted these French ladies at their toilette, in fashionable dress and elegantly decorated rooms. The only differences between their 'bathroom' and that of a farmhand in Provence were the comfort of their surroundings and the quality and design of their porcelain. Current country bathroom decor in France combines a frugal look and a few historical references with simple, quality materials. Notice how none of these pictures show the ornate, curvy, wooden "country French bathroom vanities" that are sold under this name in the (non-French) western world. The two central photos above show 'vanities' made of drywall and then tiled, with curtains instead of cabinet doors. The fabric adds a soft quality to the otherwise 'zen' bathroom style. The French bathroom vanity to the right is a repurposed desk, with the top tiled to keep the water from spoiling the wood. The round washbasins recall the look of antique porcelain washbowls. Other French country bathrooms I've seen recently include the one to the left. The style is very of-the-moment, but the bathroom retains a rustic simplicity, and the materials have a raw, natural feel. This bathroom contains more color than the one above: some vibrant blue floor tiles, a red ceiling, an expanse of green glass. Now, do all these contemporary examples mean that you shouldn't have your Louis XV French bathroom vanity? Of course not. Just be aware that French country bathrooms in styles that predate the 20th century are completely made up. They just didn't exist much before 1900. On the other hand, rather than 'faking' your antique French country bathroom decor, you can always integrate a French antique piece (or reproduction furniture) into a stylish, contemporary French country bathroom. Choosing Bathroom Vanities - Excellent, eminently usable advice to help you choose the right designs and materials for your bathroom: Rob Levesque's Home Style Choices is a treasure trove of knowledge, information and great tips when it comes to remodeling your home. What could you do to turn a run-of-the-mill bathroom into a 'country French' affair? Here are some elements for you to play with. Whether tumbled marble, mosaic tiles, or glazed tiles with old-fashioned patterning, they all look good in French country bathrooms. You could tile the whole room, or just a few select surfaces. Tiling the top of an old/antique piece of furniture (e.g. an old table or cupboard) will integrate this piece into a contemporary, state-of-the-art bathroom. Boxes or tins with French writing? Framed pictures of your favorite region of France? French country bathroom decor is all about bringing "Frenchness" to life for you. Mixing antiques into a current decorating style can work beautifully, and French country bathrooms are the perfect place to try it. You don't need to have original French antiques to create a unique, stylish "French" country bathroom. Just make sure that what you're using is not conspicuously American, African, or Asian ;-) ... Most old pieces will fit the bill. Look for a competent, creative builder. They should find it very easy to replicate any of the above bathroom design ideas to your specifications. Here's a list of fun, frugal French Country Interior Decorating ideas for your bathroom. Turn your French country bathroom into a retreat with French Country Colors. French country bathrooms need window treatments with attitude - French Country Curtains. Pick up some more bathroom decor ideas on the page about French Interior Design - it's quirky, elegant, outrageous and seriously chic. Return from French Country Bathrooms to French Country Decorating. Return from French Country Bathrooms to the Dream Home Decorating homepage.